Happy 9th Hatch Day Skittles! Neotropical Pigeon - "Skittles" (born 3/29/10) Cockatiel - "Peaches" (1995-2015) R.I.P. Budgie - "Sammy" (1989-2000) R.I.P. Budgie - "Sandy" (1987-1989) R.I.P. Skittles is 9 y/o today! I 'officially' celebrate his birthday on April 11th cause thats the date I adopted him, but today is just as special cause its the day he hatched from a lil bitty egg! I have no sense of humor because my humor makes no sense. Re: Happy 9th Hatch Day Skittles! Aw, happy hatch day Skittles! 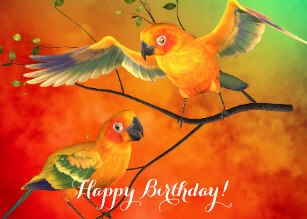 To A Sweet Neotropical Pigeon! Aw, you guys are just too sweet! Thank you all for the beautiful hatch day wishes. Terry & Allee, Skittles just loves the beautiful virtual cards! Happy slightly belated hatch day little feathered dude! A very happy BIRDDAY to our little Skitty-de-doodle-dee-do!